Jules Chéret (1836-1932), Nouveau théâtre, 15 rue Blanche, Scaramouche, 1891. Lithographic poster. 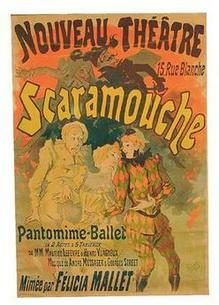 The Parisian ballet/pantomime Scaramouche had a story written by Maurice Lefèvre and Henri Vuagneux together with music composed by André Messager (1853-1929). 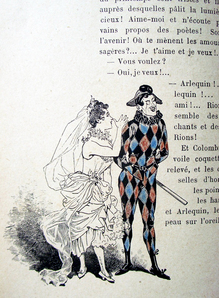 For the show’s opening on October 17, 1891 at the Nouveau-Théâtre 15, rue Blanche, the celebrated artist Jules Chéret (1836-1932) was commissioned to design a poster. 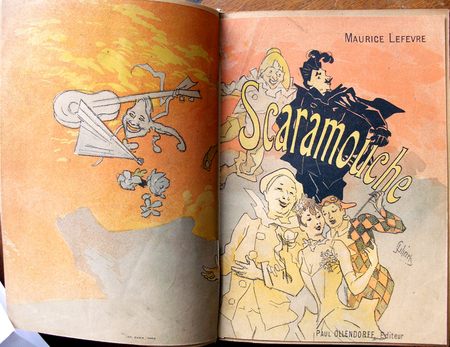 Within the same year, publisher Paul Ollendorff simplified Chéret’s design and used it as a frontispiece for the publication of the libretto. There was a vogue for the artist’s brightly colored designs and Ollendorff knew the image would sell the book. —Louis H. Gibson, “Jules Chéret,” Modern Art 1, no. 1 (Winter 1893).